Easter is a great time to visit the NSW Southern Highlands. The weather should be good, there is an excellent selection of new release wines available, and all the winery cellar doors are open. The Barrawang Markets on Easter Saturday are well worth a visit, with over 130 stalls run by local producers and crafts people selling a diverse and eclectic range of goods. There is also entertainment provides for children as well as adults. The Barrawang Markets are open from 9.00am to 3.00pm on Saturday 19th April, on Hoddle & Crown Streets, Burrawang. Phone 02 4886 4216 for more information. For music in the vines the Highlands oldest vineyard and winery, Joadja Wines, is hosting a free concert on Sunday afternoon. Music will be by long time favourites “The Reluctant Consort”, and the event will no doubt be run in Joadja’s usual organised and enjoyable way. In addition to the free concert there will be food including their famous wood fired pizza, and of course fine Joadja wine! One of Australia’s most awarded Blues group ‘Backsliders’ will be appearing at Joadja Vineyard’s Music in the Vines on January 26 2014, from 1pm, bringing a new and dynamic dimension to the Joadja series of winery concerts. The 2011 ARIA Blues and Roots nominees and I-Tunes Australia Album of the Year winner have been playing and recording for 25 years. Their latest release ‘Starvation Box’ is heralded as their best to date and has been described as sounding like ‘hungry youth Deep South’. Their sound melds driving Delta and Mississippi Hill Country blues sounds with original 21st century new blues anthems. Slide Guitarist and multi-string instrumentalist, songwriter and vocalist Dom Turner is the founding member of the group. His influences are many and varied – a blend of delta blues, piedmont blues, rock, dub and sounds of Asia. He has appeared on ABC Radio, presented music workshops at festivals and universities and has toured the USA & Mexico as a solo artist. The Group has appeared at The Basement, made numerous television appearances in Australia and are regulars at major Australian Festivals. Drum and percussion virtuoso and songwriter Rob Hurst, a name synonymous with Australian music and has been with Backsliders for 12 years. Joining Dom and Rob are two of Australia’s most innovative harmonica players Brod Smith and ARIA Award winner Ian Collard. So drop by for the fantastic music and the wood-fired pizza, and taste the fine cool-climate wines at Joadja’s rustic Cellar Door – the oldest in the Southern Highlands! There is an amazing Irish Australian music event at Joadja Vineyard and Winery this Australia Day weekend. A remarkable afternoon of Irish Australian Folk and Rock, Joadja wine and wood-fired pizza kicks off at 1pm on Saturday 28th January! Peter Mackie – on bass, and a past member of pre-Wiggles band The Cockroaches. More details and RSVP on the Joadja Winery website. There is a lot happening in the NSW Southern Highlands wine world right now. The Days of Wine, Art & Roses Festival kicks off on November 1st and runs until Sunday 21st 2010. The festival is a treat to all the senses for residents and visitors alike. The Southern Highlands Wine Trail explores the many boutique wineries in the region, giving the opportunity to find great wines while enjoying the picturesque countryside and mild climate of the Highlands. You can drive yourself around the wine trail, taking advantage of how every winery is just a short drive away through lush farmlands. Or you can join one of the organised Southern Highlands wine tours and let them do the driving for you so you can sample more of the local drop. Either way you can’t go wrong. The Southern Highlands really are another world, yet they are little more than an hour’s drive from the Sydney CBD. Plus you can enjoy the beautiful Rose Gardens, and take in the local culture on the Southern Highlands Art Studio Trail. 6 & 7 November 2010 – Studios in Aylmerton, Balmoral, Bowral, Braemar, Burradoo and Mittagong. 20 & 21 November 2010 – Studios in Bundanooon,Burrawang, Canyonleigh, Fitzroy Falls, Medway, Moss Vale, Robertson and Wildes Meadow. There is free entry from 10AM -4PM each day. Meet local artists and artisans producing paintings, textiles, jewellery, ceramics, sculpture, woodwork, mosaics, bookmaking, ceramics and more. Tertini Wines, who scooped the pool of prizes at the 2008 Southern Highlands Wine Show, sold off a cancelled export order of their 2003 and 2004 Cabernet Sauvignon/ Merlot at bargain basement prices. Those who dropped in to the Tertini Cellar Door at Kells Creek, near Mittagong, quickly enough cleared out these easy-drinking reds in record time. The party starts at Bowral on Sunday November 29, when the B-52s, Mental As Anything and The Proclaimers kick off the season with a high energy concert at Centennial Vineyards. Australia’s favorite party animals, Mental As Anything, will open the show, followed by brilliant twins The Proclaimers from Auchtermuchty, Scotland, then the USA’s B-52s will have everyone dancing with their upbeat fusion of musical styles. To book online for the B-52s, Proclaimers and Mentals, click here for reserved seat tickets, or here for general admission tickets from TicketMaster. This continues an amazing year of music in the NSW Southern Highlands with performers such as Leonard Cohen, Paul Kelly, The Triffids, Alicia Keys, Lowrider, and Jordin Sparks appearing in previous “a day on the green” concerts at Centennial Vineyards , along with winery events like Jazz at Joadja creating a fine blend of wine and music throughout the region. The vineyards, restaurants and food producers of the NSW Southern Highlands are presenting the best of the region’s food and wine. The Cool Flavours Festival runs Friday 5th June until Sunday 7th of June. Come and sample local cheeses, jams, chocolates, mushrooms and a vast array of top quality Cool Climate wines. Centennial Vineyards Restaurant – Produce Dinner Saturday 6th June. Four course menu by renowned chef, Robin Murray, featuring Southern Highlands produce. Bookings required. Southern Highland Wines – Family Fun day. – Rides and Games, stalls, Wine tasting for Parents, Barbeques, Entertainments – Bring the whole family for a fun-filled day. Mt Ashby – FLAVOURS OF FRANCE. Famous for Beef Bourgeonon Pie and a Charcuterie Plate which includes home grown and made Remoulade, Pork Rillettes a selection of French Cheeses and other French delicacies. Plus a showing of French Farmhouse tables and Antiques by Sally Beresford, and an “Art in the Mist” Exhibition. Small Cow Farm – Cheese Appreciation and demonstrations, – Bookings essential – 9.30 am,11.15am. and 2pm Saturday and Sunday. $22. Please book by phone on 02 4885 1241. Cuttaway Creek Raspberry Farm – Berry Jams, sauces, vineyards from fruit grown on the property. Raspberry tarts and Chocolate Mousse from the Belgium Chocolate Mousse factory. Blue Metal Wines – Café and tastings: visit the Bluemetal winery to try their Award Winning Wines and a special festive Winter Tasting Plate. Cellar Door open Thurs-Mon 10am to 5pm and Cafe open Long Weekend 11am to 4pm. Tel (02) 4877 1877. Bousaada Wines – Jazz in the vines and local Produce Platters. Milk Factory Gallery – Wine tastings from six local vineyards, plus a range of local produce at the gallery store. Tennesee Orchards – open for sales. Highland Hamper Company – Hampers of local produce on sale at venues and the Milk Factory Gallery. Canyonleigh Store – Tastings of local wineries – sales and music. Sutton Forest Estate Wines – homemade Tiramasu with Pinot Noir wines and Italian antipasto platters. Tertini Wines – taste the unique Arneis grape with Italian cheeses. Mrs Oldbuck’s Pantry at Berrima – tea leaf readings, tastings etc. Li Sun Mushrooms tunnel tours. $20 pp. Meet at Bowral Swimming Pool at 10.30am, 1.30pm, and 3.30pm. Book on 02 4872 1447. For more detailed information click here for the Southern Highlands Food & Wine Association website or phone 02 4872 1447. Hoping to see Leonard Cohen, Paul Kelly and The Triffids in their Bowral concert but Sunday Feb 1st is too hard? Joadja Vineyards & Winery has come to the rescue with their Music in the Vines event – on Sunday January 25th of the Australia Day long weekend. And Music in the Vines is free as well as convenient, so even if you are going to other Southern Highlands winery music events it may be worth checking out Joadja. You could always drop in to Centennial Vineyards at Bowral on your way and work out your parking strategy.. In keeping with Australia Day, the Joadja Music in the Vines event features Australian Folk Music, with a bit of Bluegrass, from local group The Songcatchers. 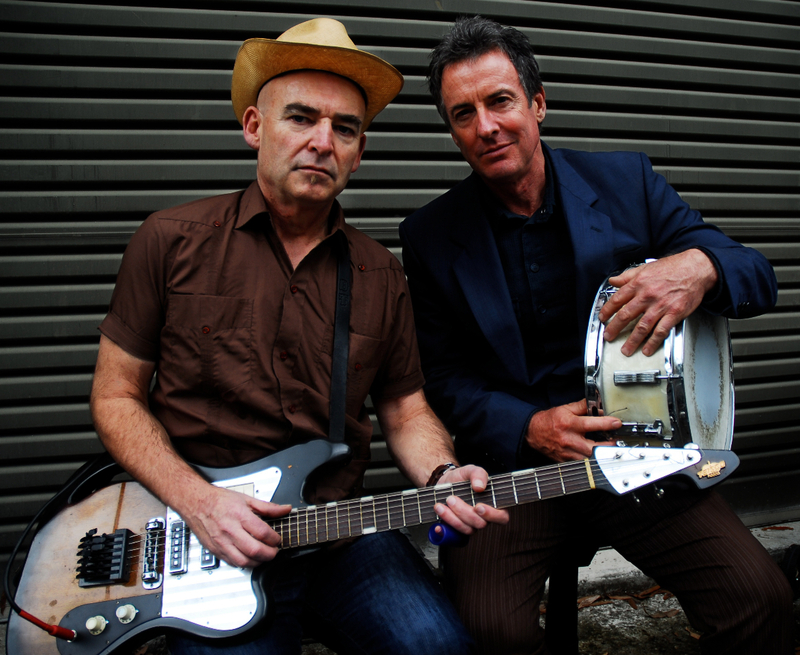 The Songcatchers include John Hall and Aussie folk veteran Bob McInnes. More details and an RSVP form can be found at www.joadjawinery.com.au – just click on “Music in the Vines”.